36 MMS December 2016 mmsonline.com DECIDING FACTORS A Focus on Data-Driven Manufacturing CO NTR I BUTO R DAV I D E D S TRO M , M e m ex I n c. (m e m exo e e.c o m) O verall equipment efficiency (OEE) is considered a critical measurement of how well a manu- facturing unit is doing. The formula is simple: It multiplies the percentages of availability, perfor- mance and quality to yield a single percentage. This result enables similar units (one machine, one department, one plant or an entire enterprise) to be compared or rated against a target such as a plant's best record or a benchmark of world-class per- formance. Focusing on OEE enables manufactur- ers to pinpoint factors that hold back productivity. Significantly, recent developments in data- driven manufacturing make calculating OEE easier, faster and more accurate—and acting on it more ef fective. For example, these benefits are an important advantage of connecting machine tools to a network for data collection and monitoring. However, shops and plants must also focus on profitability. Managers have to balance deci- sions about maximizing the part-making capabil- ity of their equipment with decisions about the money-making potential of this equipment. OEE OEE May Not Be Enough ratings alone provide an incomplete picture. One development that seeks to address this shortcom- ing is called Financial OEE (FOOE), a trademarked name for a new feature of MERLIN Tempus Enter- prise Edition (EE) from Memex. MERLIN (Manufacturing Enterprise Real-time Lean Information Network) is a communications platform for real-time manufacturing analytics. Tempus is the company's suite of applications for machine monitoring such as real-time views of the plant floor, custom dashboards, reporting, alerting and other functions related to data-driven manufacturing. Tempus EE adds OEE, job sched- uling and other modules such as FOEE. Memex has partnered with noted OEE expert and author Robert Hansen to develop this approach. 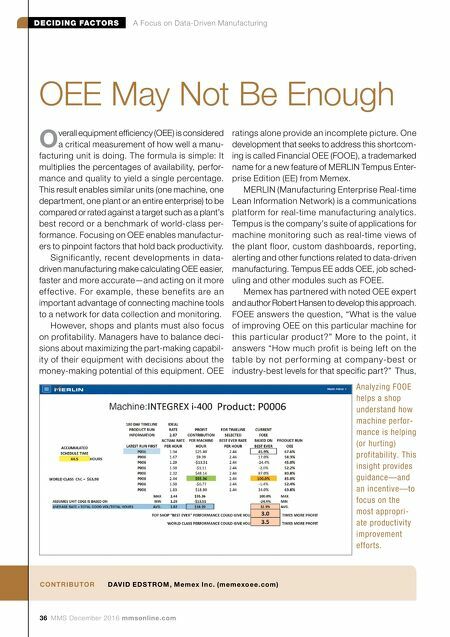 FOEE answers the question, "What is the value of improving OEE on this particular machine for this par ticular product?" More to the point, it answers "How much profit is being left on the table by not per forming at company-best or industry-best levels for that specific part?" 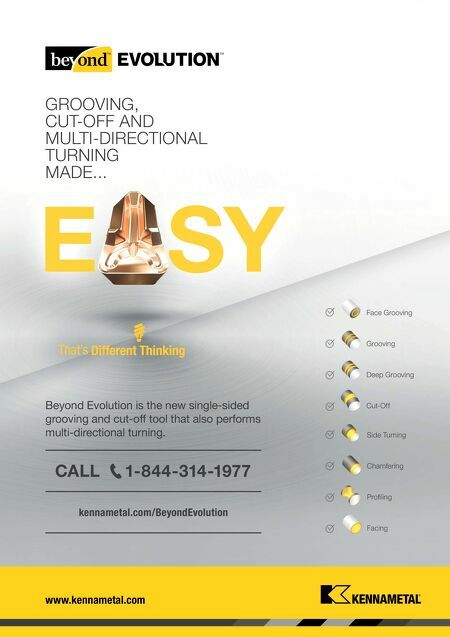 Thus, Analyzing FOOE helps a shop understand how machine perfor- mance is helping (or hurting) profitability. This insight provides guidance—and an incentive—to focus on the most appropri- ate productivity improvement efforts.